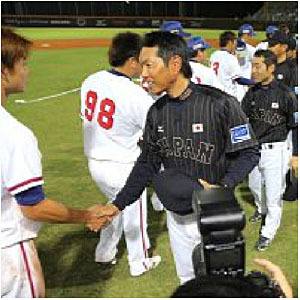 TAIPEI (Kyodo) -- A young Samurai Japan squad defeated Taiwan 1-0 on Sunday, completing a three-game sweep of their series in Taipei as Hiroki Kokubo made his managing debut. Four pitchers combined on a three-hit shutout, although the Japan starter, DeNA BayStars rookie Kazuki Mishima dodged a couple of bullets in the first two innings before his teammates reached the scoreboard in the third at Taipei's Tianmu Baseball Stadium. With two outs and none on in the third inning, Hiroshima Carp sparkplug Ryosuke Kikuchi singled, stole second, went to third on a wild pitch and came home on a single by the Rakuten Eagles' Takero Okajima off 21-year-old collegian Kuo Chun-lin. Kuo allowed a run on five hits. He struck out six without issuing a walk, but ended up as the unlucky loser. Taiwan, which had lost each of the first two games in the series by a 4-2 score, wasted a golden opportunity in the first after Mishima walked the first two men he faced. But Seibu Lions catcher Ginjiro Sumitani picked the lead runner off second, Mishima got an easy fly to short and retired Nippon Ham Fighters star Yang Dai-kang on a comebacker to end the inning. Mishima got out of jail again in the second, when he had two on with one out but served up a 6-4-3, inning-ending double play. He allowed two hits and three walks, while striking out three. Orix Buffaloes rookie Takahiro Matsuba followed with three solid innings, in which the only runner he allowed reached on an error. The lefty earned the win. Shoichi Ino of the BayStars allowed a hit in a scoreless eighth, and Lotte Marines closer Naoya Masuda struck out the side in the ninth to close out the series.